La Palina Cigars holds within its arsenal some of the world’s finest, most sought-after cigar blends. 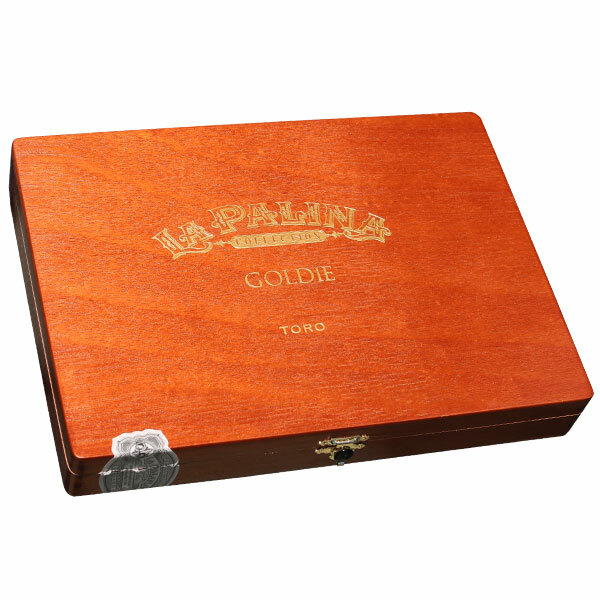 One such collection—the cigar that put the La Palina brand on the map—is known simply as “Goldie.” The Goldie blend first debuted in 2012 with La Palina Goldie Laguito No. 2 and the cigar was quick to gain a following, due to the fact that the entire run of 10,000 cigars were rolled by a single roller—Maria Sierra. Maria is Cuban-trained and regarded as one of the world’s highest-ranked torcedores. Each year since the original release, La Palina has commissioned Maria Sierra to craft a new size of the Goldie blend. For 2017, the cigar is now on its 6th iteration, being introduced in a 6” x 52 Toro size for the first time! The Goldie blend features an exquisite recipe of tobaccos, including Nicaraguan and Dominican fillers, an Ecuadorian binder, and a silky smooth Ecuadorian Habano wrapper. In addition, the cigar incorporates a small amount of Medio Tiempo tobacco in the filler blend, which is a rare offshoot found on a small percentage of tobacco plants—known for its intense flavor qualities. As always, La Palina’s Goldie series is only available in very limited quantities, as the cigars are meticulously rolled by a single roller throughout the year. As such, the 2017 Goldie Toro will be sold on a first come, first served basis—order while supplies last!